What is the official size of a photo ID for a passport, ID card or driver's license? Wondering what photos to provide for an administration? You are right, because the right format, the right size of a photo ID varies by country. There are standards for identity photographs. 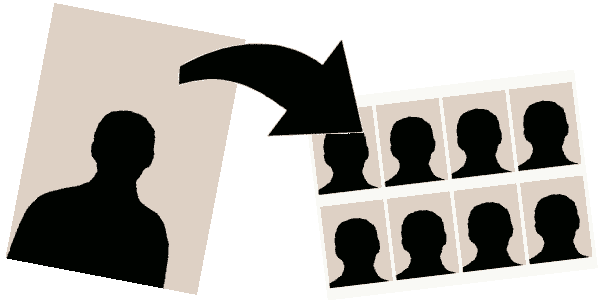 The size of an identity photo, for example for a passport, is regulated. The photo must measure 50.0 mm in height and 40.0 mm in width (50.0 x 40.0 mm). The photo must measure 1.5 inches in height and 1.5 inches in width (1.5 x 1.5 inches). Which equals 38 x 38 Mm. The photo must measure 45.0 mm in height and 35.0 mm in width (45.0 x 35.0 mm). The photo must measure 2.0 inches in height and 2.0 inches in width (2.0 x 2.0 inches). Which equals 51 x 51 Mm. The photo must measure 70.0 mm in height and 50.0 mm in width (70.0 x 50.0 mm). The photo must measure 48.0 mm in height and 33.0 mm in width (48.0 x 33.0 mm). The photo must measure 2.5 inches in height and 1.5 inches in width (2.5 x 1.5 inches). Which equals 64 x 38 Mm. The photo must measure 47.0 mm in height and 36.0 mm in width (47.0 x 36.0 mm). The photo must measure 60.0 mm in height and 40.0 mm in width (60.0 x 40.0 mm). The photo must measure 35.0 mm in height and 35.0 mm in width (35.0 x 35.0 mm). The photo must measure 50.0 mm in height and 35.0 mm in width (50.0 x 35.0 mm). The photo must measure 40.0 mm in height and 30.0 mm in width (40.0 x 30.0 mm). The photo must measure 50.0 mm in height and 50.0 mm in width (50.0 x 50.0 mm). The photo must measure 53.0 mm in height and 43.0 mm in width (53.0 x 43.0 mm).